> Outdoors > Best Rock Climbing Spots in the U.S. Interested in trying rock climbing but not sure where to go? We’ve got you covered. In no particular order (they’re all amazing! ), here are five of the best rock climbing spots in the States. Even if you don’t plan on chalking up and strapping on a harness, gazing upon the natural beauty found at these climbing destinations is definitely worth a visit. There’s a distinct otherworldly vibe at this famous climbing area located in the Mojave Desert of Southern California. The mars-like landscape is loaded with climbable rock formations—over 400 total—with thousands of routes that keep climbers of all skill levels coming back year and after year. With world-class boulder problems, bolted sport-climbing routes, trad routes, and top rope opportunities, there really is something for everyone. And although “J-Tree,” as it’s known, can get crowded at times, with so much high-quality rock, solitude can be found if you’re willing to do a bit of hiking. Rising tall and proud above the northern plains of Wyoming, Devil’s Tower is a must-see geological wonder whether you plan to climb it or not. If ascending the monolith’s 867 feet from base to summit is on your day’s agenda, you’ll be greeted by some of the finest crack climbs found anywhere on the planet. 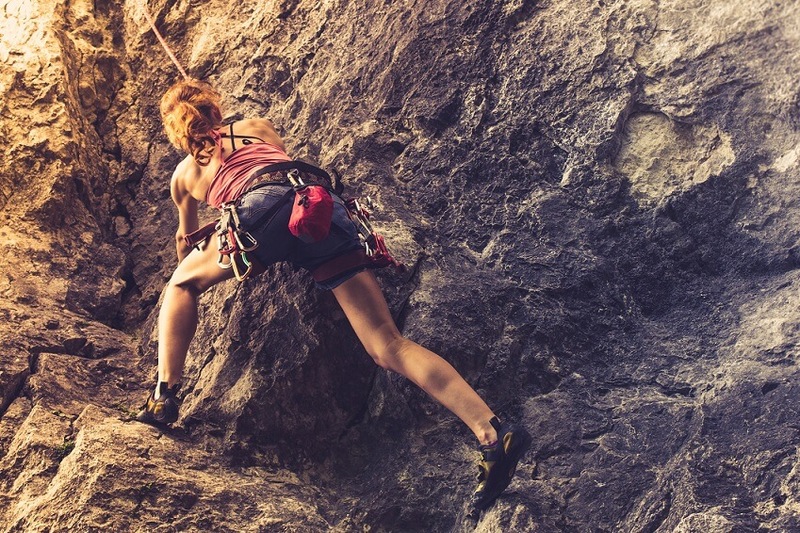 While there are some bolted sport routes available, most climbers reach the top by wedging temporary anchors for their ropes into the plentiful “splitter cracks,” a climbing discipline known as “trad” or “traditional” climbing. This style of climbing is widely regarded as the most difficult in terms of the technical skills required and should only be attempted by climbers with years of experience. If that isn’t you, several guiding operations in the area would be all too happy to take you to the top. It’s possible to climb Devil’s Tower every month of the year, but at 5,112 feet above sea level, winter can bring loads of snow and the best climbing conditions generally occur from April to September. 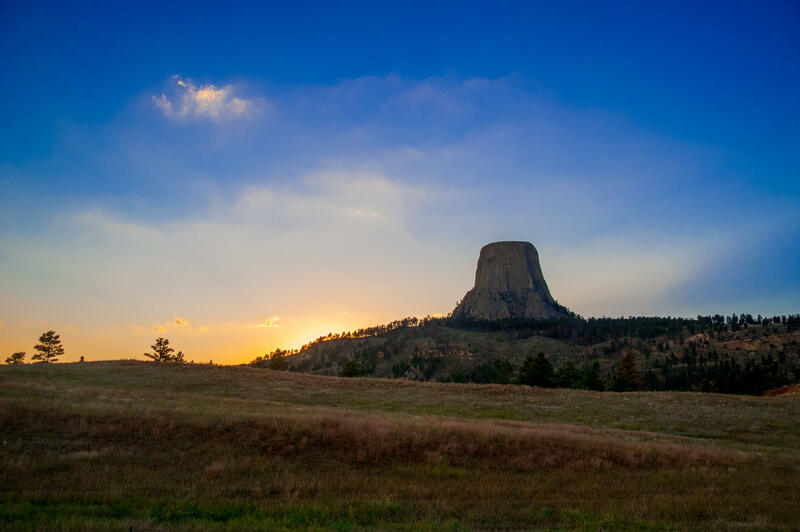 Visiting the monument is free of charge and there’s a visitor center where you can learn all about the Tower, the history of the region, and the Native American tribes who deem it sacred ground. As soon as you cross the Mississippi River heading east, rock climbing opportunities diminish quickly. That is, unless you make tracks for the Red River Gorge in Kentucky. Here, you’ll find an unbelievable quantity of high-quality sandstone cliffs across a huge swath of both public and private land. What’s exciting is that while there are many established climbing areas, there’s still lots of climbable rock that has yet to be explored. This is one of those rare frontiers left in the climbing world and is where you’ll find elite climbers sending progressively harder, ever more technical routes to leave their mark in history. The vast majority of the climbing in “The Red,” as it’s known, is performed on well-maintained bolted sport routes. Sport climbing is a discipline where climbers clip “quickdraw” carabiners and their ropes into fixed anchors on the rock to arrest a fall. Most bolted anchors are installed purely by volunteers who provide an invaluable service to the rest of us climbers who reap the benefits. There are routes for all skill levels in The Red, from easy routes with big jug hand holds to extremely overhung walls with tiny crimps barely big enough for a fingertip. When you visit, be sure to stop by Miguel’s Pizza and Climbing Shop, a local watering hole known for its phenomenal pies that also serves as a museum for the area’s climbing history. With one of the highest concentrations of big walls over 1,000 feet tall, Zion National Park is a trad climber’s haven. While the area is known for its abundance of long, sustained, multi-pitch climbs on bright orange desert sandstone, there are also lots of options for more casual climbers—i.e. those of us who aren’t willing to sleep on the wall! 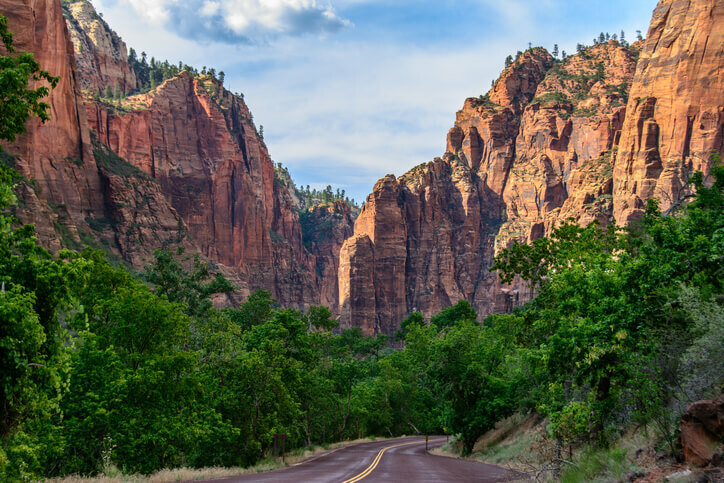 Several areas within the park, such as Kolob Canyon, feature some exceptional sport routes that offer easy access and the opportunity to climb only one or two pitches. Some climbing areas in Zion, however, are very remote, requiring long, arduous hikes through the spikes and thorns of cactus country. Since summer temperatures rise well above 100 degrees, spring and fall generally offer the best conditions for climbing in Zion. Regardless of when you visit, one of the most important things to remember is to never attempt a climb at Zion after a rain or snow storm as the sandstone here is extremely fragile and unpredictable when wet. Most sources recommend waiting at least a week for the rock to dry out in order to avoid the dangers of crumbling rock. And always wear your helmet! 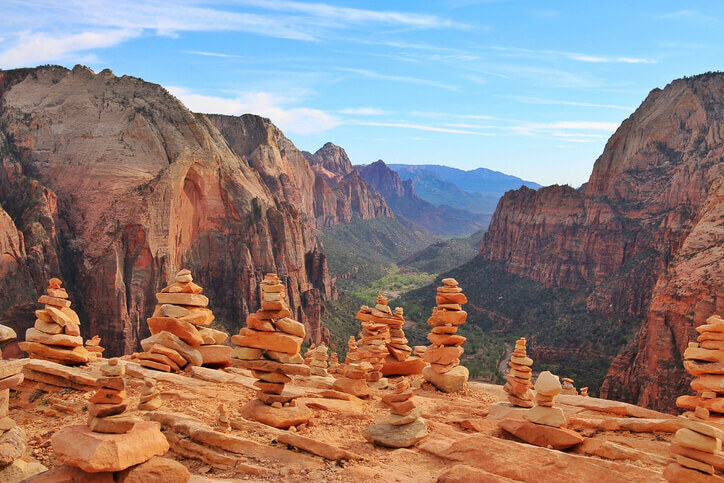 In addition to rock climbing, Zion National Park also boasts a mind-boggling array of hiking and multi-day backpacking opportunities. So, if you’re not feeling up for a 1,000-foot-plus climb, just lace up those boots and hit the trails! Keep in mind, however, that the area is a nesting zone for Raptors and Peregrine Falcons and the National Park Service does issue park closures and restrictions in certain areas for the preservation of the species. Regarded as the birthplace of rock climbing in America, Yosemite National Park is where devout rock climbers from around the globe go to test their skills on the epic granite faces of El Capitan and Half Dome. These massive monolithic rock formations dominate the landscape and if you look closely in the early morning hours of spring or early fall, you’ll likely dozens of climbers camped out on “portaledges” suspended thousands of feet off the valley floor. Most big wall climbing feats in “The Valley,” as the park is known, are performed in three to five days—yes, without touching the ground—using trad climbing techniques. While such pursuits have grown in popularity in recent years, only the most seasoned climbers around find success by reaching the summit. Looking for a tamer Yosemite climbing experience? Easy! There are many closer-to-the-ground climbing opportunities in The Valley if you know where to look. With over 1,722 (and counting) documented climbing routes including trad, sport, toprope, and bouldering opportunities, you’ll find a lifetime’s worth of climbing in Yosemite. Plus, this place is absolutely gorgeous and loaded with hiking trails to get you to all the best climbing spots, with plenty of waterfalls and wildlife along the way. Ropes, harnesses, carabiners, quickdraws, helmets, climbing shoes, chalk bags, tow bags, portaledges, crash pads, daisy chains . . . The list of gear needed to get up a rock face never seems to end! And that’s not including the all the clothing, camping gear, and coolers full of food you’ll need to make the trek to your destination and to sleep comfortably once you get there. Keeping everything organized and accessible in your vehicle can be a big challenge if you don’t have some systems in place. Luckily, at Travall, we have some solutions to help make your climbing journeys more organized and less stressful. Since your trunk will likely be stacked to the ceiling to fit everything, a Travall Guard cargo barrier should be first on your list of vehicle accessories. Fitting over the rear seat of your SUV, a Travall Guard ensures that all that gear stays put in the back. To bring even more organization to your trunk while also providing space to bring your dog along, a Travall Divider splits your trunk area in two, maximizing every inch of usable space. All Travall vehicle accessories are made to fit specific vehicles, so take the first step by looking up your make and model to start outfitting car for your upcoming climbing adventures today!